Membership DOES come with PRIVILEGES! 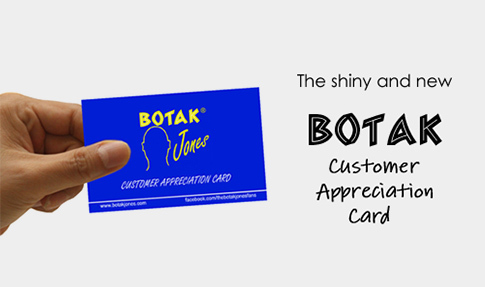 Be part of the BOTAK family and you’ll certainly be rewarded. Get out FREE Customer Appreciation Card and enjoy 10% of your bill each time you dine with us. And on your birthday month, you get 15% off. Are you an existing member of our CAC privilege program? You’re in for our treat. Fill out our form below to qualify for our upgrade to our new loyalty card. For every 10 points, it will be exchanged into S$5 vouchers AND you get one year free membership on us.